Fatman iTube valve dock with speakers review | What Hi-Fi? In the words of Bill Hicks: “Who would have thunk it?” Valves and MP3, audio concepts from different time periods and philosophies coming together in harmony. This is a two-box plus stereo speakers implementation of the valve dock. 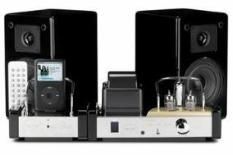 The package includes a classic-looking valve amplifier and an iPod dock connected via a line-level input, plus the compact black speakers. There's another input for wiring up a CD player, and a cable for connecting a non-Apple MP3 player. In action, the iTube sounds stunning, with incredible musical insight for such an affordable device. The amp sounds as rich as perceived wisdom tells you valves should. That, coupled with the occasionally thin sound of MP3 files, means the balance is spot on. The richness doesn't come as a huge surprise, but where the Fatman breaks with valve tradition is in attack, because it has plenty of drive and thump on tap, and is capable of getting the best out of the likes of American Music Club's Patriot's Heart. Instrumentation and vocals are well served too. The only thing lacking from its sonic canon is out and out volume. It's worth noting, though, that these are optional speakers, and we'd plump for a specialist hi-fi product like Tannoy's Custom F1s every time – they improve the sound subtly in just about every area over Fatman's own. This Fatman design (without speakers) was good enough to win a Product of the Year Award in 2007, and merits five stars on its own, which just shows the high esteem in which we hold it. But in this instance the optional speakers slightly let the side down.